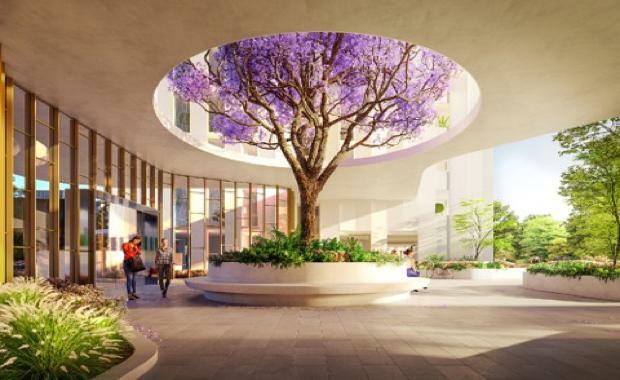 Celebrated as one of Australia’s leading developers of high-quality, multi-residential lifestyle developments, Golden Age Group has partnered with an all-star design team to deliver one of Sydney’s most impressive and holistic projects of 2016, Park One. Positioned in the heart of Macquarie Park, the location of Park One at 80 Waterloo Rd is unparalleled, with Macquarie University railway station close enough for a well-timed stroll, but far enough away that residents hear nothing of the frequent train service. Macquarie Centre, Macquarie Park CBD and Macquarie University are also conveniently placed so that shopping, meeting friends for a meal or skating at the ice rink are all only minutes away. This is one of the most dynamic and progressive areas of Sydney, but residents are beautifully buffered by the 5,500 square metres of tranquil urban forest surrounding Park One. Multi-award winning architects, Turner Studio, a Sydney design practice that has honed its skills with a widely varied portfolio of residential, commercial, cultural and public buildings are the architects behind two elegantly curved towers. They have created graceful shapes and shimmering facades that echo the natural beauty of the surrounding gardens and Lane Cove National Park. It was also the National Park that inspired Michael Drescher of top-tier design firm DKO Architecture, when conceptualising the interiors of Park One. The natural language of the park and garden is a strong rhythm that underpins all aspects of the sophisticated design. The result is elegant and harmonious with an authentic beauty that immediately feels warm and welcoming. The tones and textures of nature echo the serenity of the surroundings. Timber floors, wool carpets, stone benchtops, marble trim and neutral colours create the perfect background while flashes of gleaming brass add glamour. Finely detailed finishes underline the quality of the meticulous fit-out. Surrounding the shimmering buildings, over 5,500 square metres of luscious green parkland sets Park One apart as a truly unique and luxurious development designed with ease-of-lifestyle as the primary focus. Aspect Studios, an Australia-wide landscape architecture practice with a raft of awards, carefully designed the outdoor space to create a flexible, urban sanctuary where residents can exercise on the running track, play badminton, relax at the outdoor cinema, take the children to the playground, read a book on the lawn or find a secret corner for quiet contemplation. Throughout Park One Aspect Studios have also specified a mix of native and exotic plants — a plan that will provide privacy, pleasure and a new benchmark for luxury. 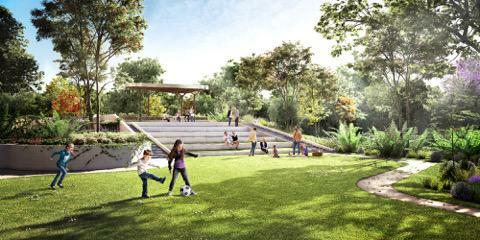 Golden Age Managing Director Jeff Xu said the project has been extremely well received by the local market. “The response from the local Sydney market has been overwhelmingly positive with over 2,000 people registering their interest, and over 400 people putting down a $5,000 deposit for an apartment at Park One ahead of the public launch this Saturday, October 15," he said. The Urban Developer is proud to partner with Golden Age Group to deliver this article to you. In doing so, we can continue to publish our free daily news, information, insights and opinion to you, our valued readers.